This colorful backsplash gives the kitchen a fresh, modern style. A kitchen backsplash is typically installed behind an oven or kitchen sink in order to protect the wall from spills and splashes. The right kind of backsplash will also provide decoration for the wall and can make a significant impact on the style and aesthetic of your kitchen. If you're looking for kitchen backsplash design ideas and installation, Norway Built has you covered. We offer complete kitchen remodeling, including beautiful backsplash installation, throughout Illinois. Contact us today to schedule your free estimate! 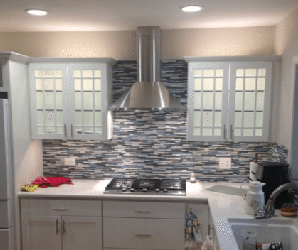 Norway Built is your expert kitchen remodeler in Illinois, and we specialize in both vinyl kitchen backsplashes and tile kitchen backsplashes. We can install an elegant kitchen backsplash that will transform the look and feel of the room! Our vinyl backsplashes are affordable and easy to clean so that you can enjoy the stylish appearance without needing to stress about maintenance. Our tile backsplashes can provide custom designs and give your kitchen the perfect finishing touch. Best of all, both backsplash materials are versatile enough to provide either a contemporary or a classic look. Are you ready to move forward with your home remodeling project in Naperville or an area nearby in Illinois? Contact us today to find out more about our kitchen remodeling options or to schedule your free estimate on kitchen backsplash installation, kitchen island design, or any of our other remodeling services!